"He's coming for you, Jack, to seek revenge." Disney has released a new international trailer for Pirates of the Caribbean: Dead Men Tell No Tales, directed by the two Norwegian filmmakers who made the film Kon-Tiki. This trailer features plenty of new footage, though the coolest reveal is that this movie has ghost sharks in it. What! This also has an appearance by Keira Knightley. 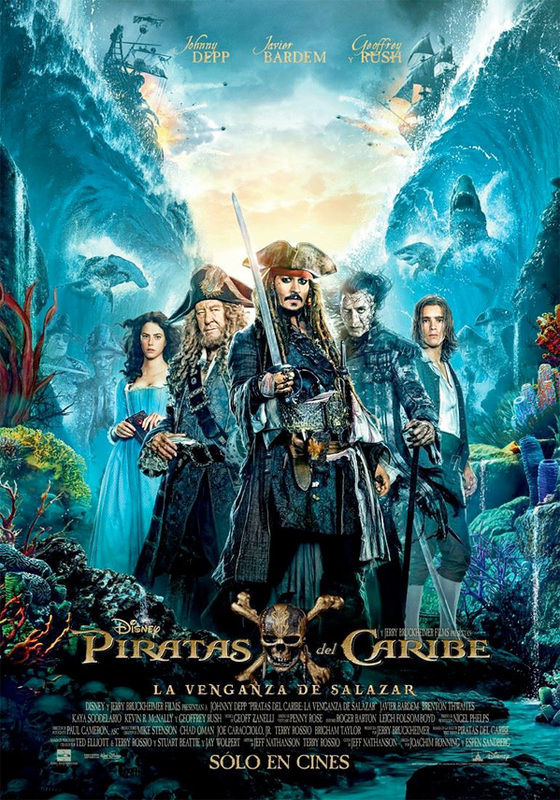 Johnny Depp is back as Captain Jack, along with Javier Bardem as Captain Salazar who has a vendetta against Jack, plus Geoffrey Rush as Barbossa. The full cast includes Brenton Thwaites, Kaya Scodelario, Orlando Bloom, David Wenham, Kevin McNally, Golshifteh Farahani, and more. Disney's marketing is actually getting my attention, but I'm still not sure if I'll go see this. There's also a 5 minute preview playing before GOTG Vol 2. You can watch the other full-length trailer for POTC: Dead Men Tell No Tales here, or the Super Bowl spot.